We got so bored staying in China that we decided to change things up. Now we’re in Venice, Italy. Actually we just crossed the street from our hotel in Macau and now we’re visiting the Venetian. So we’re still in China. So even if you’re not a huge gambler there is still plenty to do in Cotai Central here in Macau. There are so many hotels that you can visit and every hotel usually has a unique show that they put on. 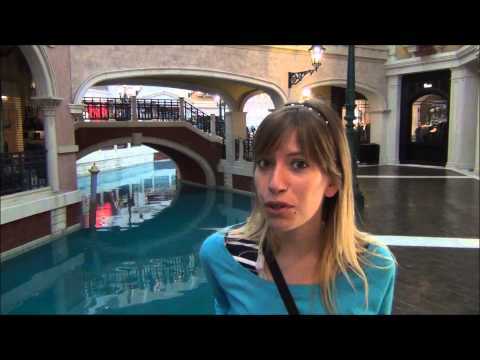 Here at the Venetian you can ride the Gondola and just feel like you’re in Italy for an afternoon. Then the hotel we were staying at was having some kind of Shrek parade which you missed out on. I did miss it but Sam loved it. Oh wow, yes! There is just lots of shows and different performances that you can attend in the evenings. So plenty to do aside from gambling. Coming early in the morning was a really good idea. We basically almost have this whole place to ourselves. Well, Macau is a place where dreams come true. You make a little wish and throw your coin into the water. Being the high roller that I am. I’ve got a Macau ten cent piece here. Which I’m going to throw. Missed it. You missed it? Nice. And of course 1 baht. what? Great camera work on the coin toss. I got the splash at the end. The after splash. I’m actually shocked there is another one of these, I love the one in Vegas! Holy cow that place looks amazing.